I love Cauliflower Rice. I love it as a side, especially with Indian food, like this Easy Shrimp in Curry Sauce pictured with Cauliflower Rice. Check under my menu for Rice dishes as the bottom of the page for more recipes. I also love Cauliflower Rice plain, and I love it with a little Parmesan. I can seriously just eat it as a meal. But what I don’t love? Making it. Seriously, the regular way of making Cauliflower Rice is a pain. It’s a pain to make and it’s a pain to clean up after (all those tiny pieces of cauliflower, everywhere!) and it’s a pain to stand at the stove sauteeing it. Honestly, if I’m putting in that kind of babysitting at the stove, I’d rather be making something a lot better than cauliflower rice. Something chocolate? You can buy cauliflower rice, all prepped and ready to cook, but you’ll probably find it’s not available everywhere, and if it is, not consistently, and it’s going to be pricey. Speaking of which, cauliflower has become so trendy it is getting pricey. Check Aldi if there is one nearby, if not watch the per head vs. the per pound price. If it’s per head, buy the largest one you can find! If your cauliflower ever gets a dusty, dark coating, simply slice it carefully off. It’s harmless and generally stays mostly on the outside surface. If you’re going to cut that coating off and store the cauliflower, clean your knife before each cut. So here’s your answer for Super Simple Instant Pot Cauliflower Rice. It will turn out perfectly every single time. All you have to do is cut your cauliflower into consistent pieces and be careful not to overcook it in the Instant Pot. You do have to really follow the prep instructions carefully. I know because I’ve made a lot of pots of cauliflower rice to get this just right. And I’ve tried leaving the cauliflower whole, cutting it in big chunks & cutting it in slices. None of them gave me cooked cauliflower that was the same texture throughout, which meant it wouldn’t mash correctly into rice-like pieces. Over and over I was getting rice that was too hard or too soft to mash in the Instant Pot, or sometimes the cauliflower was a mixture of both too hard or too soft. I wanted Instant Pot Cauliflower Rice with a beautiful al dente texture. The texture has to be soft with just a bit of a bite. The issue? The IP is going to cook based on the density, volume and amount. The short cook time that cauliflower needs doesn’t allow much room for error. It has to be cooked enough to mash into “rice” but not cooked so long it’s going to be too soft or soggy. And it has to be cut right to be consistent. In order to get a perfectly cooked cauliflower that can be mashed to pieces in the pan (without turning to mush) you’ve gotta be pretty precise in the cutting and follow the weight, size, and timing in the directions to the letter. It doesn’t take long to do, it just has to be done right. A kitchen scale is a near must, but a good eye for estimating might get you by. Oh, and you’re going to have to count! I’ll explain, below. What you’re going to get for that careful prep is going to be marvelous! And take just minutes. And it’s so simple, I can guarantee you’ll be eating delicious, healthy Instant Pot Cauliflower Rice a LOT more often. Carefully prep cauliflower as directed above, trying to keep the florets intact; try pulling them apart by hand or cutting by using the knife from the bottom of the floret to the top so it separates cleanly. Add one cup water to the bottom of the Instant Pot, add the rack and evenly arrange florets across the top. Add the lid, seal and set to low pressure for two minutes…BUT…the cauliflower needs to cook for 1 1/2 minutes. Watch the instant pot carefully after it comes up to pressure (this will take about five minutes) and after the first minute of cooking, count (or use a timer) cook for 30 more seconds. Immediately manually release the pressure. Remove the rack & the cauliflower as soon as the pot is able to be opened, then remove the liner and any stray florets that have fallen through the rack into the liner. Discard water and put liner back in the instant pot. Set to saute. Add oil or butter if using. Add the florets back to the pot and using a potato masher, break the cauliflower down to small pieces. Cook to desired doneness, a minute or two to dry the rice, a little longer if you’d like a bit of color. Add salt to taste. This entry was posted in Click here for Fabulous Food Posts and tagged Cauliflower, cauliflower rice, hearty sides, Instant Pot, Side, Vegetable Side. Bookmark the permalink. I laughed about not wanting to have to work so hard for something that wasn’t chocolate. 😂 Is it possible to steam the cauliflower and then use a potato ricer? I too would not like to use a food processor. Hmmmm. I think it would work perfectly well to steam it! You’d need to steam a bit longer, though. I think the holes might be too small…just my guess. I gave my ricer to my daughter for baby food…and my food mill! Hmmmm. I will have to experiment. I don’t even know what happened to my food mill. That never worked for me. It always got stuck. 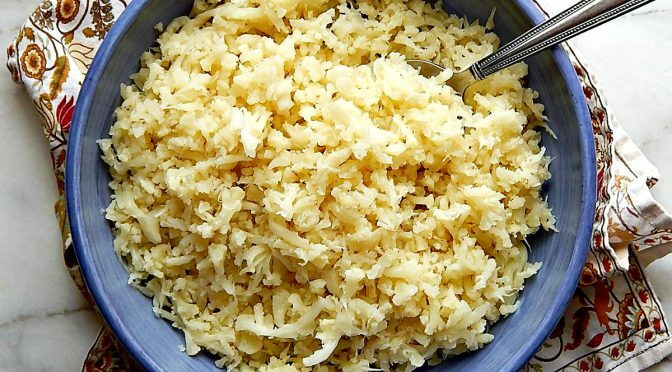 Love cauliflower rice and this post is very helpful Mollie. Thanks for sharing it with us at FF! Wow! I haven’t thought of any other way of making cauliflower rice. Good one, Mollie! Have a fab week & thanks for sharing! My pleasure, Jhuls! 🙂 You too! Great idea for a side dish, next to a juicy steak – delicious! I know, but I just had to add a steak in the combination haha 😀 Nevertheless amazing dish! Good on you Mollie for preserving and experimenting with this! It really makes cauliflower rice easy! Trader Joe’s here sells pre-riced cauliflower that only needs a quick saute…call me lazy! I get your drift! After I figured out that 1 minute 30 seconds was the perfect time for a pound of cauliflower, I thought maybe I’d experiment to find out how much cauliflower I’d need to cook perfectly for 2 minutes (because that will go by the timer on the instant pot and you’ll get the chime) but I must have made about 10 batches by that point and just couldn’t eat any more! Maybe for a future post?